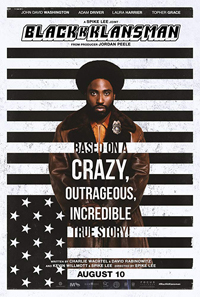 Posing as a racist extremist in the early 1970s, Ron Stallworth, the first African American on the Colorado Springs Police Department, contacts the Ku Klux Klan and finds himself invited into its inner circle. He cultivates a relationship with the Klan's Grand Wizard, David Duke. Stallworth's colleague Flip Zimmerman poses as Stallworth in face-to-face meetings with the Klan gaining inside knowledge of a deadly plot. Stallworth and Zimmerman team up to take down the organization whose real aim is to sanitize its violent rhetoric to appeal to the mainstream.